Please call us today on 01543 721001 or Submit An Enquiry. We provide flexible managed IT support solutions tailored to your business needs, we also offer simple pay as you go support services working alongside your existing IT team or as your outsourced IT team. We offer a comprehensive range of IT services ensuring that your systems run smoothly and efficiently, enabling you to do what you do best! Our services include IT security, networking, consultancy, training and business continuity. Blue Footprint were early adopters (since 2005) of cloud computing and have been using a wealth of cloud solutions for several years working with technology leaders including Microsoft and Google. This positions us well to provide expert guidance and services. Telecoms is an essential part of any business. We will find a solution that best fits you and allows you to run your business as efficiently as possible. Our range of telecoms solutions includes phone systems, unified communication, network connectivity, broadband and lines. Blue Footprint have supplied our assortment of computers and associated equipment for several years. They provide a fast and efficient service covering a wide spectrum of problems that small Company’s like ours have from time to time. We would have to recommend them for their support and the efforts they provide to keep us on-line enabling us to provide fast and responsive services to our international customer base. Blue Footprint provide excellent support when we need most. Probably one of their longer standing clients I’ve always enjoyed very good support from Blue Footprint. Their service packages are excellent and well worth signing up for. Any technical problems are dealt with instantly and professionally. As a one man business Blue Footprint have provided me with excellent IT support with immediate responses & solutions for problems for the last 3 years. Blue Footprint took the time to visit our premises to fully understand our business needs and came up with a couple of different proposals, talking us through the benefits of each. The new hardware was installed quickly and data migration was handled swiftly and trauma free. 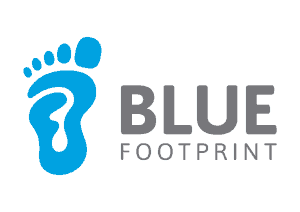 Blue Footprint explained the process step-by-step and kept in contact to we ensure that we had encountered no problems, helping to deal with any issues that arose in a timely manner. Everyone we have dealt with at the company has been friendly, efficient and helpful and we would not hesitate to recommend them.